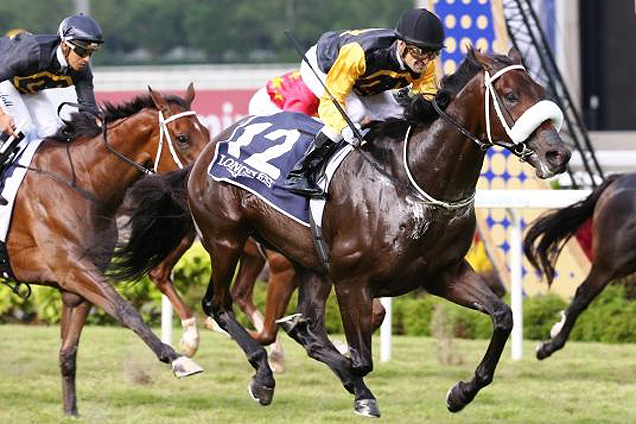 Singapore will in the end not be without runners at Hong Kong’s all-stars racing rendezvous, the LONGINES Hong Kong International races on December 11 after Quechua was handed a last-minute berth in the HK$16.5 million Group 1 LONGINES Hong Kong Vase (2400m). When the first line-ups were rolled out for the four marquee races last Wednesday, no Singapore horses were featured at the glamour event. With only two horses, namely Quechua for Patrick Shaw entered in the Vase and Laughing Gravy for Cliff Brown in the Vase and the Group 1 LONGINES Hong Kong Cup (2000m), expectations were not really high for a Singapore representative to make the cut since Spalato in the Group 1 LONGINES Hong Kong Sprint (1200m) in 2014. But with Japan’s Erupt’s recent withdrawal from the Vase, the Sports Road Club had to find a replacement. With Shaw’s dual Gold Cup-Derby winner the next cab off the rank, they came knocking at Kranji’s door. “I’d like to thank the Hong Kong Jockey Club for the invitation. It’s always fantastic to get the opportunity to measure up against the world’s best,” said Shaw who is no stranger to the HKIR circuit. “Quechua got in after Erupt was withdrawn. The invite came at the last minute, but the race (Vase) still fits into his programme as he just ran in the (Dester Singapore) Gold Cup a week ago (fifth to Bahana on November 20) and is still fit. “He just needed one or two gallops. He will have his last gallop on Saturday before he leaves for Hong Kong on Monday. “Barend Vorster will keep the ride in the Vase and (assistant-trainer) Ricardo (Le Grange) will be there with him. Quechua will stay all day and I’m sure he’ll do his best. Shaw, who is taking 6 ½ months of sabbatical leave from December 15 for health reasons, is no stranger to the HKIR having saddled Rocket Man twice in the Sprint. The champion sprinter came agonisingly close in 2010 when a short-head second to JJ The Jet Plane but was soundly beaten in 2011. Shaw did, however, take centrestage at Sha Tin once, when the same Rocket Man dead-heated with the John Moore-trained One World in the 2010 Sprint prelude, the Group 2 Cathay Pacific Jockey Club Sprint (1200m). An Argentinian-bred six-year-old by Pure Prize, Quechua has long been one of Singapore’s better credentialled horses, boasting a handy record of eight wins from 26 starts for more than $2.8 million for the Avengers Stable, including three at Group level. Two of his highest acclaims came in the Group 1 Longines Singapore Gold Cup (2200m) in 2014 and the Group 1 Emirates Singapore Derby (2000m) in 2015. Quechua will, however, face some of the world’s best stayers in the Vase, including three International Group 1 winners, none more fearsome as Aidan O’Brien’s recent Breeders’ Cup (2400m) turf impressive winner Highland Reel, Grand Prix de Saint-Cloud winner Silverwave from France and Japanese Oaks winner Nuovo Record who recently made history by becoming the first Japanese-bred and trained horse to win at Del Mar. Connections’ unwavering belief that Crouching Sun could run out a strong mile was vindicated on Sunday despite an earlier failure. Relative newcomer Siam Royal Orchid has not taken long to stamp his mark as another talented three-year-old in trainer Michael Clements’ stable.